The Williamson Cup Foundation is being set up to support and promote programs that increase participation in golf. Since 1964 the WC tournament has encouraged this goal. The Williamson Cup has promoted junior golf for over 50 years. 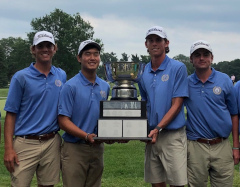 Currently, 9 golf associations in the Northeast USA and 2 in Canada each send four juniors to play 36 holes of stroke play in an event which requires the sponsoring club to provide accommodations for them in local homes for the 2-3 days of the event. Selection of the players is determined by the associations. The idea behind the Williamson Cup is to give young players a chance to meet in a family environment. The typical response from a host family, association or hosting club has been: "What a delight it was to have (a particular player) as a guest." The modern way of communication (social media) has allowed for lasting friendships long after the players' involvement. Some of the young gentlemen have gone on to play professional golf while others have used golf as a base for successful careers. Now, in our 50 plus year, the foundation is raising funds for junior golf. Funds raised for the foundation will be applied first, to the costs of each year's event, and then 80% of the balance will be distributed to those of our member associations who come up with the best plan for new or expansion of existing programs designed to increase the numbers and type of juniors to learn this great game, its rules and traditions. It's our belief that the people best able to come up with new ideas are those at the grass roots, the associations. The balance will go to an endowment fund. Please allow 24 hours for a response to your request for information. You may also contact anyone of those listed on our contact page for more information.